Fable Legends is set to take the series in a brand new direction, ditching the single-player focus and instead teaming up four would-be heroes with a devious villain in order to tell a brand new tale of cooperation. In previous Fable games, players usually underwent a solo journey, questing around the countryside all by your lonesome, or perhaps with a poochy companion, in order to make your name known throughout the land. Whether or not said name was uttered with reverence or fear was dependent on how you chose to play the game, with a morality system helping shape the player and world that evolved throughout the campaign. While players can certainly tackle Fable Legends by their onesies, my hands-on time with the game at E3 2014 made it clear that a four-player party is the way to roll this time around. For our demo, a team of four good guys, including yours truly, took on a level crafted by a sole villain. Our merry band of heroes got used to the game’s controls while the villain took some time to fine-tune their level. While the good guys see the game from your typical third-person view, the villain gets a sort of bird’s eye view of the playing field, able to move the camera about and see exactly what’s going on at all times. The villain can do some fine-tuning of their level before the heroes dive in, or they can spend as much time as they want crafting a devious layout, save it as a template, then simply load it up when it’s time to smash the intruding do-gooders. Being a hero, though, my job was simple: Kill the bad guys. Fable Legends uses a class-based system and, at launch, the developers hope to have at least 12 characters ready to roll. Only four were available during the demo, including your basic tank, soldier, archer and magic user. Each have their own strengths and weaknesses, unique abilities and motivations for going on this grand adventure. The story of Fable Legends is set hundreds of years in the past, ditching the more modern setting of Fable 3 to return to a time when legends were being formed. Players will begin their journey in Bright Lodge, the hub city where they will be able to take on side quests, interact with NPS, change their equipment, get new gear, etc. As you make your way through the campaign, you can choose to tackle each mission as either the heroes or the villain. The intro cinematic and results will alter depending on which side you choose to play. And, just like the heroes, your villain persona can level up, too. Earn new abilities, tougher troops and even bring creatures into zones they would not typically inhabit just to throw the heroes some extra curveballs. As the heroes, our goal was to overcome the villain’s traps and monsters, which they were able to trigger whenever they liked. Our villain was especially deceptive, triggering a wooden gate that could be destroyed and, as soon as we gathered around to destroy the gate, they dropped a round of artillery on the same spot. Being the archer, my experience with the game was basically what you would expect out of a third-person shooter. My crossbow was rapid fire, but my lack of heavy armor meant it was best for me to stick to the back of the pack or find a perch to rain down pain upon our enemies. We also discovered some nice combo attacks, like having our magic user freeze an enemy, then having me hit the icy figure with some exploding rounds. The game’s flow was what you would expect out of pretty much any class-based dungeon crawler. Our tank tried to draw everyone’s fire, the soldier tried to strike fast and get out of the way before the enemy could retaliate, and the magic user and I hung back and picked off the stragglers. Knowing that an actual player was controlling the dungeon was also a cool experience, as her evil laughter could be heard on the other side of the room while my comrades and I did our best to handle her minions. 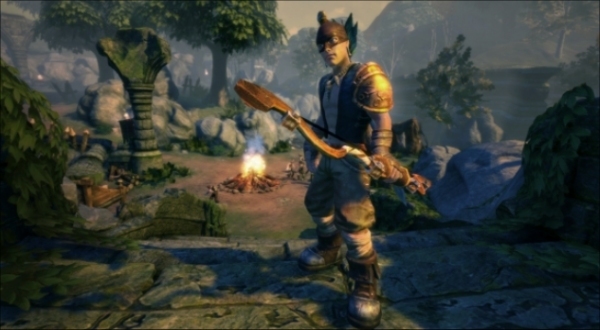 With a launch window of “sometime in 2015,” we probably won’t see Fable Legends on the Xbox One for quite a while. But the team is planning a beta sometime this fall to get the ball rolling on final tuning. In its current state, the game plays well and looks nice to boot. It's always nice to see a splash of color to help set a game apart from the drab palette that’s more common these days. I’m interested in seeing how this mission-based, dungeon-crawling gameplay plugs into the greater world of Fable Legends but, for now, the game is shaping up nicely.